The ITC Deputy Assistant Commissioner for Category Management provides executive leadership over a portfolio of acquisition solutions through which customer agencies procure more than $9 billion in IT products and services to carry out their agency missions. These solutions include the Government-wide Acquisition Contracts (GWACs) Alliant 2, Alliant Small Business 2, VETS2 and 8(a) STARS. In addition, the portfolio also includes Enterprise Infrastructure Solutions (EIS) and the USAccess shared services program. Crystal’s guidance and oversight of our category teams will ensure that ITC continues to play a critical role in the Administration’s IT modernization efforts to drive a more efficient and effective government for the American people. Crystal came to ITC from GSA’s Technology Transformation Service (TTS). 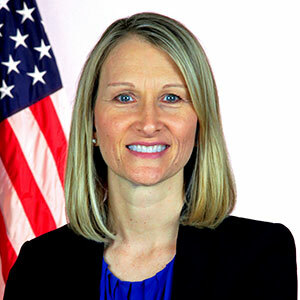 As the Assistant Commissioner for Operations at TTS, she led operations for a technology and acquisition consulting group focused on transforming the way government buys, builds, and uses technology through user-centered, agile practices. Prior to her work at GSA, Crystal was the Chief of Staff at the Internal Revenue Service. She worked closely with the Commissioner and the Senior Executive Team to ensure success on a broad range of strategic projects and initiatives for many programs critical to tax administration. She also maintained relationships with other agencies and ensured IRS input and feedback were appropriately provided to Congress, the Administration and other oversight bodies. During her career, Crystal has held various leadership roles. Her experience includes leading organizations that used large data sets to identify and deliver strategic opportunities to protect tax revenue; transformed the tax code into more than 1,100 forms, instructions, and publications used by taxpayers and tax professionals; and provided planning, inventory and distribution services for those tax products, including sending over 200 million notices to taxpayers annually. Crystal led project management activities for the IRS’s Affordable Care Act implementation and led the Health Coverage Tax Credit Program Office through an implementation of new legislative provisions required by the American Recovery and Reinvestment Act. She also led an organization that worked with community-based partners to prepare tax returns for low-income and other underserved taxpayers, and implemented a number of Earned Income Tax Credit redesign projects. Crystal holds a BA in English Literature from the University of Texas and a MA in English Literature from George Mason University. She also holds a Master’s Certificate in Project Management from George Washington University. She lives in Oakton, VA with her husband and has two daughters.